Somewhere, Jimi Hendrix is smiling. On second thought, he could be miffed. He could be saying, "If only I could be around to check out the new Tonerider pickups for lefties." Hard to say. 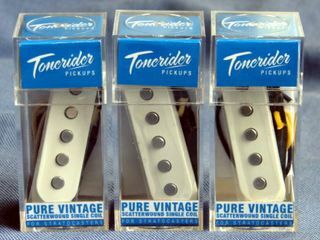 In any event, Tonerider is looking to build on the success of its vintage-improved Alnico pickup series for Strat-type guitars by releasing a new left-handed version of its best-selling Pure Vintage (TRS1). Production of the LH pickup has commenced and will be available in dealer stores and distributors in mid-May. The list price is $135.00 US dollars per set. Finding high-quality pickups with left-handed magnet staggers has always been hard, but the Pure Vintage LH goes further than just switching around the pole piece lengths. What the folks at Tonerider have done is, they've changed the magnetization across the range of positions (neck, mid and bridge), thereby making the magnets stronger in the bass position and demagnetized slightly in the treble - and, in the case of the bridge pickup, they use a mix of two different Alnico grades. The theory being that now a lefty can get 100 perfect of the performance of the design into the actual guitar tone. Sounds promising, and in the coming weeks we're going to try to give these guys a whirl. Hmmm, now all we need is to find a lefty guitar player. For more information, visit the official Tonerider website.